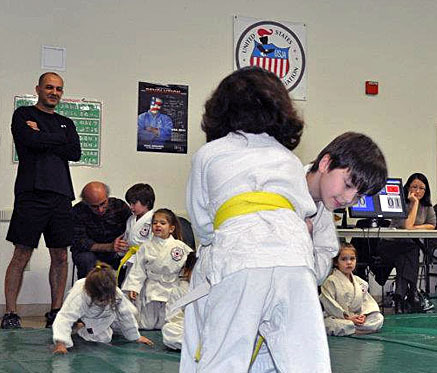 The Goltz Judo tiny tots tournament event last week featured a room full of judo fanatics. "Judo is not just about going out and throwing people and being tough," said Head Sensei and 7th degree black belt Gary Goltz. He was speaking to a handful of youths in white gi uniforms and their parents. Goltz said judo was about "the best use of your energy and power" and to "teach people to give back to the community." The tournament was on February 21 at the Alexander Hughes Community Center, 1700 Danbury Road, and featured a judo competition, demonstrations and self-defense tips. 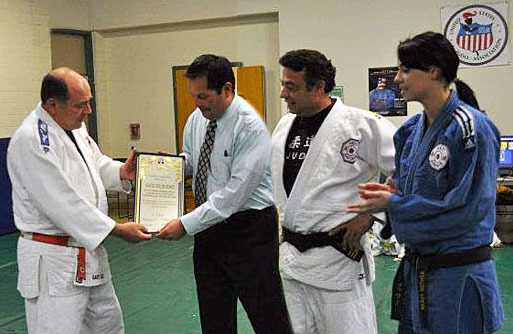 Claremont Mayor Sam Pedroza presented a certificate signed by members of the City Council to Gary Goltz and Goltz Judo. "We truly appreciate your dedication to the city," Pedroza said in his presentation. There were 28 youths who were in the tournament from ages 3 to 6, said judo instructor Ashton Farah, 23, who also officiated matches. Arman Niakan, 6, was asked if he was enjoying the tournament. "I guess so," said Niakan, who finished second in Division 8. Matt Durant, 37, of Claremont watched his 5-year-old son Lance in the tournament. "He's getting better," Matt said of his son who finished second in Division 3. Lance decided to participate after watching mixed martial arts, Matt said. "I watch MMA on television, and he thought it was kind of cool." Brenda Tremblay, 72, of Pomona said her 5-year-old grandson Thomas Tremblay really enjoyed the sport. "He loves it," Brenda said. "We're going to keep with it because he's enjoying it." Division 2: 1st, Azure Sanders, 2nd, Milana Guzman.